A man suspected of breaking into a Jamba Juice was arrested, but another man who had nothing to do with the crime was arrested after he was spotted with a samurai sword. 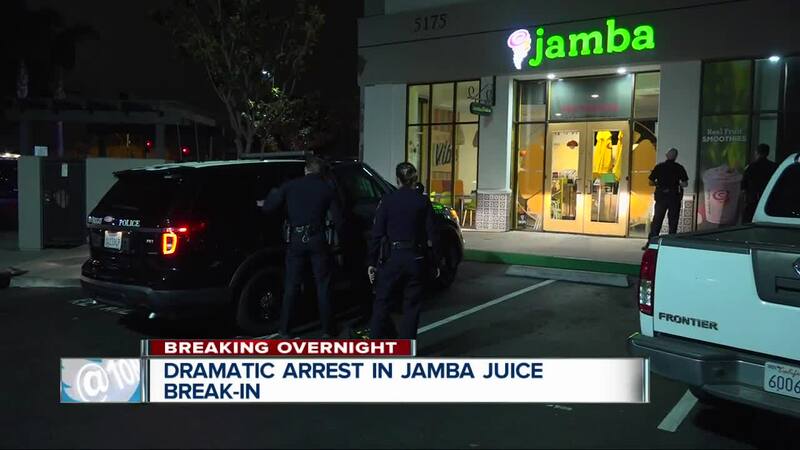 SAN DIEGO (KGTV) - Police responding to a reported break-in at a Morena-area Jamba Juice arrested two men, including one who was not involved in the store entry but was in possession of a samurai sword. At around 4:15 a.m. Tuesday, San Diego police officers responded to a report of a person smashing the window of a Jamba Juice in the 5300 block of Napa Street. When officers arrived, they spotted a man inside the store and took him into custody at gunpoint. Meanwhile, another man who happened hanging around outside of the store was questioned by officers and arrested after he was found to have a samurai sword.